I was first introduced to this man’s genius performance as Scotty, an insecure gay guy with the BEST fashion sense who had a frustrated deep infatiuation with Mark Walberg’s character Dirk Diggler in Boogie Nights. Aimee and I are both obsessed with Philip’s awesome rant. He was also brilliant in The Big Lebowski, Magnolia, The Talented Mr. Ripley, Doubt, Capote, 25th Hour and The Master. If you haven’t seen these films, I highly recommend you do, Philip can go from weak to strong to vulnerable without effort, he was a great actor. So my question is, why do the most talented people seem to be the most tormented ones? 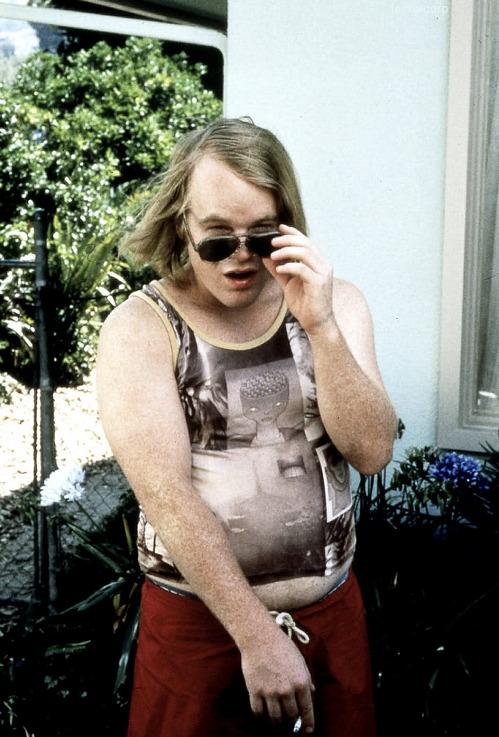 John Belushi, Chris Farley, and River Phoenix all died much too young from a heroin overdose. I hear politicians debating over marijuana usage but no one is talking about serious deadly drugs that destroy people daily. It makes me sad that someone is feeling so rotten inside they would risk death and choose to numb themselves with poison. I’m not even going to pretend I know anything about drugs, I’ve never done them and I don’t know anything about them. I guess sad isn’t the word, it feels tragic to me. Welcome to the world bebe Veda!